Thursdays in June, Free Cheesecake Offer – Buy One Get One Free at JARDIN (The Falls at West Mall, Westmoorings, Trinidad). Link to flyer. Saturday, 7th June, NATIONAL PIZZA DAY (Mario’s Pizza) – “National Pizza Day is our way of saying thank you, to all our loyal fans for the past 42 years. We have commemorated National Pizza Day as a customer appreciation day where we give back to you and ask our customers to come to celebrate with us.” Link to to Facebook event page (with details on the specials). 9th June to 7th July, #FoodieHoppin’- RESTAURANT CRAWL at eight restaurants — RuStreet; Woodford Cafe; Wild Olive; Bella; La Cantina Pizzeria (POS); The Canvas; LeVeLs Ultrabar & Lounge; and Bar Hop-in…more details here. 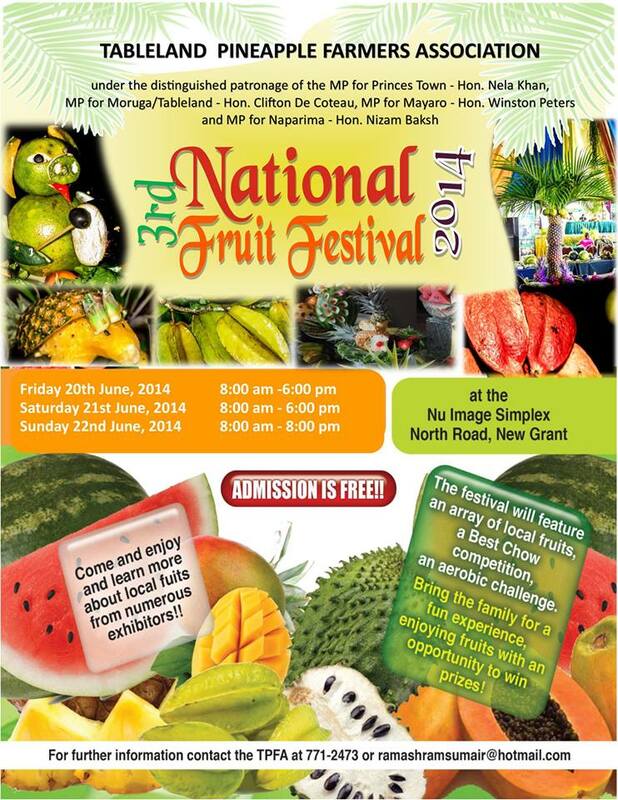 20th-22nd June, Friday (8am-6pm), Saturday (8am-6pm) and Sunday (8am-8pm), NATIONAL FRUIT FESTIVAL at Nu Image Simplex (New Grant, Trinidad). Link to flyer. FREE Admission. Saturday, 21st June, 11am-3pm, HALAL GOURMET STEAK TASTING at Vanilla Bean Gourmet (Cunupia, Trinidad). Link to event page on Facebook. Sunday, 29th June, TRINIDAD & TOBAGO MANGO FESTIVAL (Caroni, Trinidad) – More details here (link). FREE FOOD-RELATED & AGRICULTURE CLASSES IN TRINIDAD: Ministry of Food Production Farmers Training Centre’s TRAINING COURSES: Classes include Wine Making; Pepper Sauce Making; Cocoa Production; Mango Production and more. Classes are offered in Centeno, Penal, Caroni, Princes Town and Point Fortin. Link to June schedule. FREE! Links – Trinidad’s Cooking & Baking Classes; Food Festivals & Culinary Events in Trinidad & Tobago; New Restaurants, New Menus, Closings in T&T. Previous post ← English-Style Brunch @ Fanatic with Chef Joe Brown on June 1st!